Extrusion lines for blown film, lamination and coating were shown by more than 80 exhibitors, from the likes of Bobst, KraussMaffei, Reifenhäuser, Windmöller & Hölscher, Baldwin, Bandera, Macchi and Oerlikon to players such as Rajoo Engineers from India and a majority of companies from China, Korea and Taiwan. 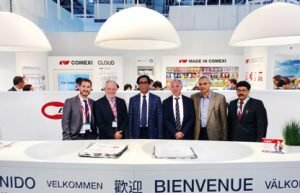 Comexi closed a deal with India’s largest multinational flexible packaging materials and solutions company Uflex at K.
Comexi released a new printing unit for its gravure press R2 and showcased its latest offset press C18 launched at drupa earlier this year. It also had its L20000 water-based laminating machine on show, next to new coating solutions and its S1DT slitter/rewinder. 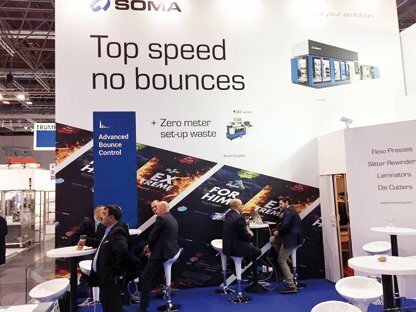 Soma showcased its successful Optima 2 flexo press launched at drupa 2016. Gallus had a small stand together with Sun Chemical, showcasing the Gallus Screeny G-Line for screen printing on glass and containers. Bobst focused on excellence in substrate functionality and process performance by spotlighting the unique know-how of its dedicated team of process specialists, called Solution Masters. It also showcased the full range of flexible packaging samples printed on its range of gravure and flexo presses at the stand. Almost simultaneously, Bobst Competence Centers in Italy, Germany and the UK welcomed many customers with live demonstrations of the latest innovations. The open house at Bobst Manchester in the UK attracted over 80 visitors, including interested Indian packaging film producers. The event premiered the new Bobst K5 Expert, claimed to be the highest productivity metallizer in the world—at speeds up to 1200 m a minute. The new metallizer, available in widths from 2450 mm to 3650 mm, can house increased roll diameters of up to 1270 mm to increase productivity. The K5 uses a 700 mm drum, the largest coating drum in the industry to improve collection efficiency by 16% while decreasing aluminium consumption. A totally redesigned evaporation source provides a coating window up to 50% wider than some competitor machines, which translates in better coating uniformity and collection efficiency while minimizing aluminum wire waste. The new K5 Expert incorporates low-friction ferrofluidic seals for better tension control on the rewind producing a virtually wrinkle-free roll-to-roll vacuum metallization process. User modes can also configure the machine in Eco mode, reducing energy consumption by 50% while on stand-by; a film-save mode; and a high deposition mode.